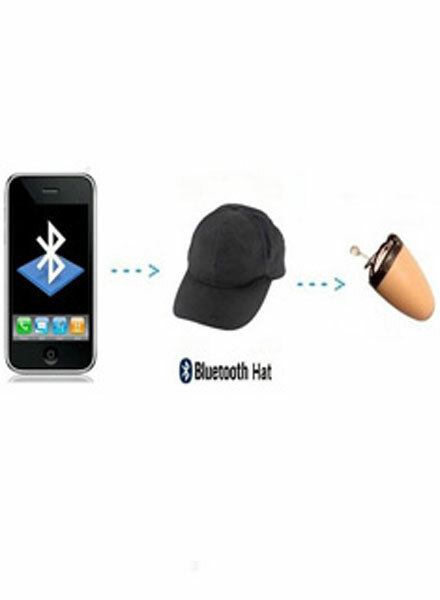 Bluetooth 2.0 module is built in the left shade of hat, so you should put the spy earpiece in your left ear, in order to get clear sound. It pairs with Bluetooth phone in 20 meters of distance. It uses a small button to control (pairing, on/off). Built-in rechargeable battery offer ~3 hours of working time and long standby time. Built-in microphone for two way communication. This benefit of the newest technologies is irreplaceable in the situations where secret communication is needed. Extra small wireless spy earpiece and sensitive microphone let you receive all the necessary information in real time from your assistance without being noticed! This model is actually a professional Wireless Spy Secret Service Earpiece for law enforcement, casino security and protection personnel. The tiny earbud fits into your ear and can receive audio instruction from your partner up to 3000' away. Just place the wallet receiver into your pocket to receive a 1-way wireless transmission from your partner on their walkie-talkie. This complete kit comes with the earbud, a covert wallet receiver for use by the earbud wearer, and Normally this kind of covert equipment is released only to CIA or the Secret Service, but now it can be yours. Spy earpiece can relieve you in situations such as taking exams and defending a thesis, during a speech or business negotiations.and you never doubt if there forbid take mobie,because they won't be forbid take purse ,right? You can secretly listen to you friend through a microphone, attached wireless signal recevier, which weighs less than 10 grams and therefore causes no inconveniences in use. No one will notice micro spy earpiece and antenna! So again, a few simple steps indispensable in certain cases – just insert spy earpiece into your ear and put you purse in the pocket! And you will easily cope with the problem – that is proved by numerous owners of our micro spy earpiece. Connect the charger with the watch, find the red indicator is on, charge the watch for 2-3 hours while first using. Do not charge it for a long time, which may shorten the battery life.